Dentsply Sirona proudly sponsored the endodontic root canal treatment of two adult lions at the Abu Dhabi Wildlife Centre in Al Wathba, by providing custom-made stainless-steel files for the operation. Above: Sarah Waldmann, our Senior Product Manager based at the Endodontic SBU in Switzerland, gifting over 100 custom-made files to Dr. Steenkamp. Two adult lions received the extensive dental procedure as a result of fractured canine teeth. Although tooth fractures are common in big cats, the treatment of these fractures are still relatively new. Dr. Gerhard Steenkamp, a veterinary surgeon with 20 years’ experience, voluntarily performed the surgery; his passion for wildlife and zoology has resulted in his national and international involvement in various conservational programs and dental treatments. He has performed in excess of 300 dental procedures on carnivores including bears, cheetahs, hyenas, and leopards, and has executed over 100 root canal treatments and extractions on lions and tigers alone. 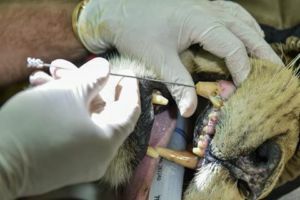 The endodontic treatments performed at the Abu Dhabi Wildlife Centre were similar to the procedures performed on humans with the same condition; the main difference being the size of the files. The procedure involved the removal of the pulpal tissue to the apex of the root in the canine teeth to remove the infection. Dentsply Sirona specifically developed a sequence of Hedstroems from ISO 030 to ISO 180, enabling Dr. Steenkamp to remove the pulp tissue with ease. The files from 030 until 140 increased in increments of ten, and then by twenty up to 180. 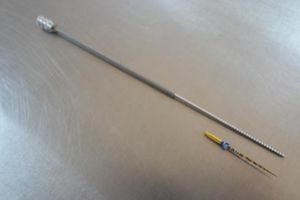 The active part per file was 60mm, and the total length without the handle reached 150mm. The custom-made Hedstroem stainless–steel hand files are the pinnacle of precision Swiss engineering. Dr. Steenkamp was impressed by the sharpness of our files, noting that these will allow him to perform procedures faster and more effectively. 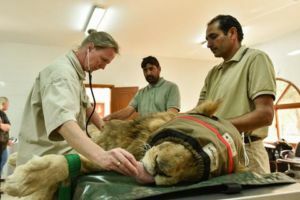 Dr. Jane Budd who administered the anaesthesia during these surgeries commented that as anaesthesia is very stressful for wild animals, cutting edge equipment such as our files will greatly benefit dental procedures as well as the overall well-being of the animals. By using Dentsply Sirona files going forward, Dr. Steenkamp will be able to reduce the amount of time the animals are under anaesthesia for, in turn lessening the profound effects of it on an animal’s physiology. Above: Dr. Steenkamp using the custom-made files, and Dr. Budd administrating the anaesthesia. Whilst it is more common to perform root canal treatments with rotary endodontics on humans, for larger animals, and in the procedure at Abu Dhabi Wildlife Centre, traditional stainless-steel manual files are often used. That being said, to find files of suitable sizes and active working lengths for dental procedures on larger animals is a difficult task. Dentsply Sirona is therefore proud to lend our support and global reach to Dr. Steenkamp’s efforts. With the production of over 100 custom-made endodontic files and the donation of an X-Smart iQ™ and ProTaper Gold™ files, we hope to enable Dr. Steenkamp to continue his good deeds worldwide. Saving animals’ teeth is essential for eating and self-defence, and root canal treatments can prevent potentially life-threatening infections. As the Dental Solutions Company™, Dentsply Sirona firmly believes that when it comes to dentistry “Endo matters”. We understand the importance of saving every tooth, no matter the size!